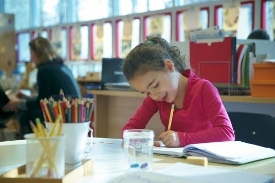 The Lower School program exposes students in Grades 1 through 4 to rich experiences that allow them to ponder, question, reflect, and refine their thinking. A combined focus on learning collaboratively and gaining individual skills helps students to understand concepts deeply. Students explore and come to understand the relationship between exercising freedom and taking responsibility. We invite students to make choices and then to reflect on them. We expect children to be respectful and considerate of others, to balance the needs of others with the needs of self, and to work collaboratively with a wide range of individuals. Throughout our curriculum, teachers encourage creative problem solving, collaboration, and independent thinking. Writing is a key component of all planning, testing, and reflection.